Should Legislatures Require Lifejackets on Commercial Fishing Boats? The Marine Accident Investigation Branch (MAIB) in the UK published separate reports on three commercial fishing accidents. In all cases, not one of the nine victims were wearing a lifejacket when they drowned. Per the report, at least four of these fishermen could have been saved if they had been wearing a lifejacket when they were thrown into the water. Since some, if not all, of these deaths were preventable, the MAIB is recommending to the Maritime and Coastguard Agency, the United Kingdom’s version of the U.S. Coast Guard, introduces new legislation that makes it mandatory for fishermen to wear lifejackets while on commercial fishing vessels. Should the U.S. Require Commercial Fishermen to Wear Lifejackets? This year has been a particularly bad one in regards to the number of drownings in the U.S. as well as the U.K. While some speculate that increasing awareness and spreading education will encourage more people to wear life jackets, evidence from all countries shows it alone has little effect on behavior. However, when combined with legislation, there is a difference in the number of people who survive falling overboard. For example, the state of Victoria in Australia requires everyone in small powerboats, kayaks and canoes to wear a lifejacket while the vessel is out on the water. A study from 2014 shows the number of drowning deaths fell from 59 to 16 after the law was passed. That said, most of the U.S. states legally require children on smaller boats to wear lifejackets. However, there is little legislation that addresses whether commercial fishermen must wear lifejackets. 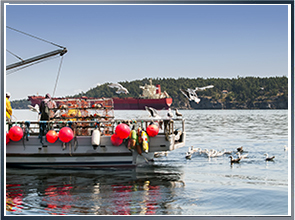 According to the National Institute for Occupational Safety and Health, most fishermen do not wear their personal flotation devices while working, despite that wearing one significantly increases the chance of survival when there’s a man overboard accident. The U.S. should follow the U.K.’s lead and better protect workers in the event of commercial fishing accidents by making it a legal requirement for fishermen to wear lifejackets while on at sea. Latti & Anderson LLP is a maritime accident law firm that fights for those who have been injured or have lost loved ones at sea. Next Are Tugboat Accidents Common?